Today’s topic in our shawl design course are triangle shawl patterns. How does triangle shawl design work? How can triangle shawls be constructed? There are various ways of approaching the design of triangle shawls: they can be knitted sideways, bottom up, top down, and eventually include center panels. 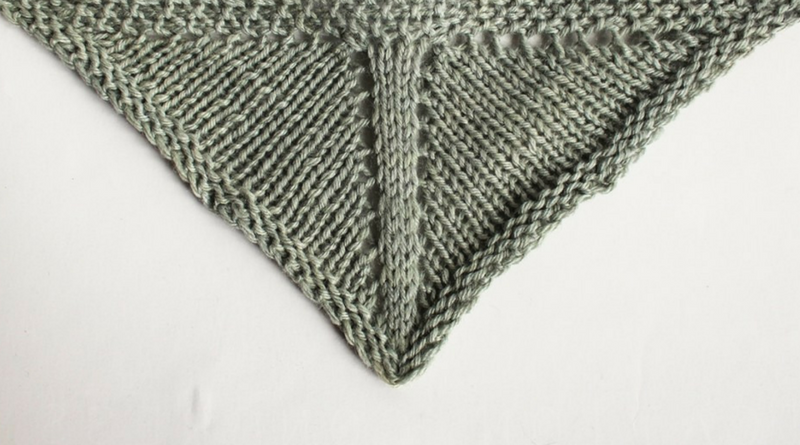 In German speaking countries, this shawl shape is often referred to as Josephinentuch, and it’s the perfect pattern if you want to knit an adjustable triangle shawl. Increases worked every row result in an increase angle of approximately 60°. Working a triangular shawl from bottom up means starting at the tip, increasing to a certain size and binding off after adding a little border at the upper side of the triangle if desired. 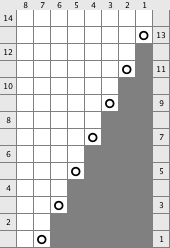 In the case of asymmetrical increases (working sideways), the increases are worked on one side only. Increases every 3rd row result in an angle of approximately 30°. Don’t let the images mislead you: the grid is square but gauge usually is not! Therefor, the images do not reflect the resulting angles accurately. Increases every other row yield angles of approximately 45°. The outline of the shawl design process for a triangle shawl worked sideways in garter stitch with increases every row is as follows. CO 3 sts and purl one row. Next Row (RS): K1, YO, k to end of row. Next Row (WS): K to last stitch, YO, k1. Repeat the last two rows until shawl is of desired size. Bind off all stitsches loosely and block gently. The outline of the shawl design process for a triangle shawl worked sideways in garter stitch with increases every second row is as follows. Working a triangular shawl diagonally means starting at one tip and working increase rows until the shawl has reached its desired size. The only difference between this version and the variant worked sideways is that here increases are worked on both sides of the shawl. This results in symmetrical increases. The increase angle can be selected at will. Increase two stitches every other row for an increase angle of 90° for instance. In this setup is possible (and common) to work the edging at the same time as the shawl body. Either way, we start with casting on three stitches and increasing continually until the shawl is of desired width (or height). Next Row (RS): K1, YO, k to last stitch, YO, k1. Working a triangular shawl diagonally means starting at the upper (wide) side, decreasing to a certain size and binding off. The increase angle can be selected at will. Decrease two stitches every other row for an increase angle of 90°, for instance. In this setup is possible (and common) to work the edging at the same time as the shawl body. The outline of the shawl design process for a triangle shawl worked top down in garter stitch with decreases every second row is as follows. Work a swatch and measure gauge. Desire on the width of the shawl and calculate how many sts to cast on based on the gauge you got. CO the calculated amount of sts and purl one row. Next Row: K1, ssk, k to last 3 sts, k2tog, k1. 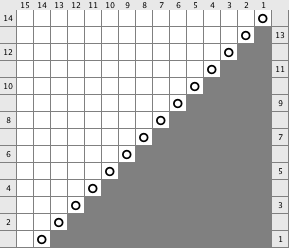 Repeat the last two rows until 3 sts are left. Bind off all stitches loosely and block gently. The trick with this construction method is to start with a small band (shown on the top of the image below – in this case, it’s a three stitch garter border) until it is long enough to pick up enough stitches for the planned center panel (in our case, a three stitch stockinette section shown as the central vertical band below) plus two stitches for the side panels. Small version of a triangle shawl started from a small band at center neck, worked top down. I made a short animation showing you how the setup for triangle shawls with side panels is created. It’s my first attempt on creating animations – please let me know if this video made the whole thing clearer for you, thanks! Decide how many stitches your center panel will be ( = N). The template uses a three stitch seed stitch border on the longer (upper) side of the triangle, therefor we have to cast on 5 (3 + 2 for the edges) stitches. Panel Setup Row (RS): Sl1 wyb, work 3 sts in seed stitch, pm, k1, pm, pick up and knit N sts along edge, pm, pick up and knit 1 stitch, pm, pick up and knit 4 sts. Panel Setup Row (WS): Sl1 wyf, work 3 sts in seed stitch, slm, p1, slm, p to next marker, slm, p1, slm, work in seed stitch to end. Next Row (RS): Sl1 wyb, work 3 sts in seed stitch, slm, YO, k to next marker, YO, slm, work N sts in center panel pattern, slm, YO, k to next marker, YO, slm, work in seed stitch to end. Next Row (WS): Sl1 wyf, work 3 sts in seed stitch, slm, p to next marker, slm, work N sts in center panel pattern, slm, p to next marker, slm, work in seed stitch to end. Repeat the last two rows until shawl is of desired size, then work a few rows of garter stitch (or any other edging of your choice), then bind off all sts loosely. Weave in ends and block gently. 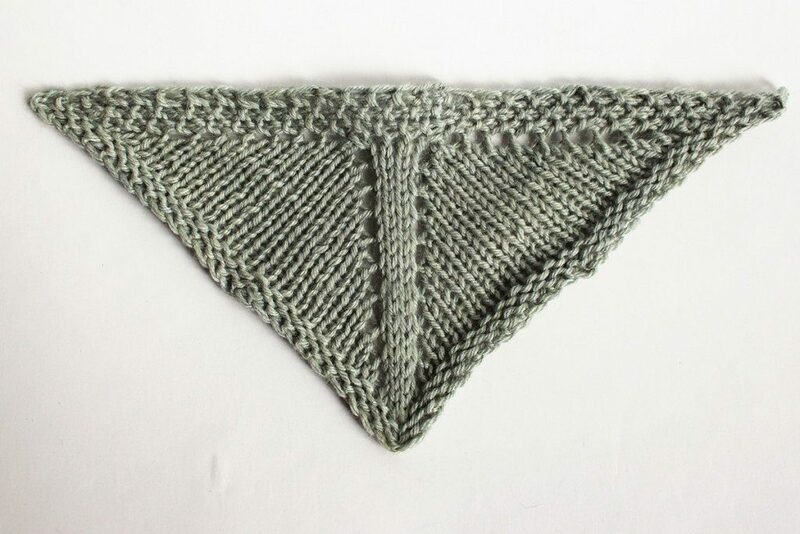 I hope there is some discussion of the directions for the pattern template for triangle shawl with center panel. What does this mean, “pick up and knit N sts along edge.” Why pick up ? My N stitches are on my needle. Where is the edge from which I am picking up? Are there more directions ? Thank you, frustrated in Philadelphia, PA.
You are working a band first with a provisional cast on, so you have live stitches on one small end of the band, and provisional cast on at the other small end. You pick up stitches from the long side of the band for the center panel (N stitches) and two additional stitches becoming your side panel setup stitches. Is it really that hard to understand? Yes, it is confusing. I don’t thing you should be rude to someone asking a question because they are frustrated. This is somewhat of a complicated pattern. It’s a garter tape cast on, nothing more. I’ll have to think about how to explain it more clearly. Thanks for your input! Are you kidding me? “Is it really that hard to understand?” Firstly, your directions were not exactly replete with good instructions, to say the least. How dare you speak to someone like that? You’re lucky anyone dignified this post with a response. I’m just really wondering if it is. Sometimes written words do not resemble the whole intention of the speaker, and English is not my first language so please forgive my unintended eventual rudeness. 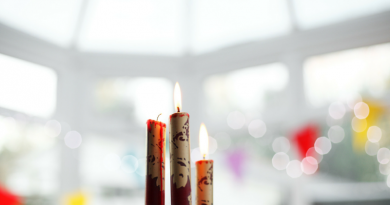 Sometimes things we consider to be fairly simple are not simple at all for others as it seems. Thanks a lot! A very helpful tutorial ideed. Exactly what I was looking for. The video is great! I have done the triangle shawl with central panel before but I could not repeat it as I have no scheme any more. Now I can easily figure out the process. It would be great to understand how to incorporate different boders and lace patterns for side panels as well. Thank you Julia for the explanations and instructions. I understand the frustration of some of the persons posting comments. There’s nothing wrong with your explanations … but I believe that these are probably more intended for persons who are more experienced with knitting. I’ve only been knitting for 2yrs. and they were a bit complex … but a friend of mine who’s been knitting 20yrs. read them and understood all of the terminology and explanations. Thanks again ! 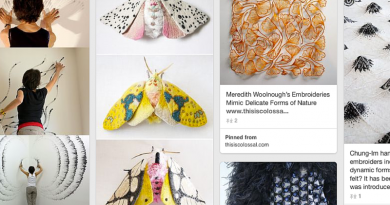 I absolutely adore your Shawl Design series! Last year I had purchased, “Shawl Design in Plain English” and I found it to be so educationally inspiring on so many levels! I am now looking into purchasing your, “Shaping Lace”, but before I do, I was wondering if the book includes blank templates? It would be so helpful if it did! I’m having a terrible time trying to figure out how to adapt lace and mosaic stitch patterns to triangularly shaped shawls. it does, but as I don’t know which charting software you’re using, I cn’t be sure whether templates for yours are included. If you provide me with. ore information I’m happy to help! I have just purchased the Japaneses Kitting Stitch Bible by Hitomi Shida- with your helpful site and that book in hand I am going to design my own shawl! thank you for the useful info. Here’s to busy hands. I found the instructions clear and quite simple. Of course, I have taken a basic beginner knitting class, so I have the fundamentals. Some of the people attempting these shawls (truly simple shawls, actually) really have NO understanding of the basics of knitting at all. So of course they are confused! Let them be. You can only lead a horse to water; you cannot make it drink! You are doing the best you can; the knitter needs to take some responsibility in following the directions. Really, I think everyone needs to take a basic beginner knitting class (or any knitting class for that matter) before attempting to do any kind of project. We should not be expected to be hand-holding everyone because they don’t know that it means to pick up stitches along the long side!! Good Gracious!! Hi Julia! Your animation explanation is GREAT!!! Thanks so much. Around the time this tutorial was published it had been over 30 years since I’d held a pair of knitting needles, and I wasn’t that great then either – as my Granny would have no doubt agreed! She is sadly no longer with us, so the fact that never a day goes by now without me doing at least a few rows – and I’m making garments, blankets, cabling and loving it – is almost entirely thanks to the altruism and generosity of spirit, knowledge and time of all the many people like yourself who have shared their skills and understanding online, and with enthusiasm too. Would I have understood this particular post 2 years ago? Of course not – but I’d have kept looking til I found one I did, and probably even bookmarked it for later, in the hope that one day I’d be experienced enough to make use of it, like I am now! So thank you very much Julia, your work and knowledge and time IS hugely appreciated…..